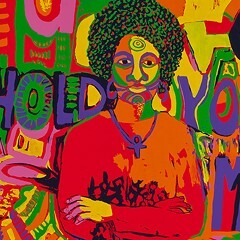 Arnold was born in Chicago in 1928, served in the Korean War, earned a master’s degree from the School of the Art Institute, and was a Loyola University faculty member (and one-time chair of its art department) from 1972 to 2000. He died in 2006; Loyola’s Ralph Arnold Fine Arts Annex and its Ralph Arnold Gallery are named for him. A gifted colorist who knew how to make the abstract riveting (his watercolor, pencil, and crayon Celebration, more than holds its own here), Arnold is best known for the collages that are the focus of this show, curated by Columbia professor Greg Foster-Rice, who also edited the generously illustrated, multi-essay hardcover catalog. Like a DJ spinning a mix, Arnold plucked and juxtaposed images from mass media, superimposing them on strips and grids of color that bind the pictures and lock in the viewer’s eye. 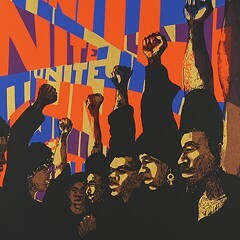 He wasn't known as a militant, but many of the collages are pointed essays on the issues of his time and ours: war and other violence, civil rights, social and economic inequity. Unfinished Collage, in the first of the two galleries the exhibit occupies, is unmissable, in part because it's a suspended triptych. Included in a 1968 show about violence at the upstart Museum of Contemporary Art (founded the previous year), it’s a three-sided chronicle of the lives and deaths of John F. Kennedy, Robert Kennedy, and Martin Luther King Jr. Each side is covered with documentary photos, and there's a framed nameplate for each of the three men slapped over them. The photos are resonant, but the real impact of the piece comes from a fourth, red-framed plate that's starkly blank, leaving the piece open-ended, awaiting the next victim. The second gallery includes work that speaks to the then mostly coded gay life Arnold also knew. His 1968 Who You/Yeah Baby—one of the most direct examples—is a riff on the famous U.S. Army "I Want You" recruiting poster. 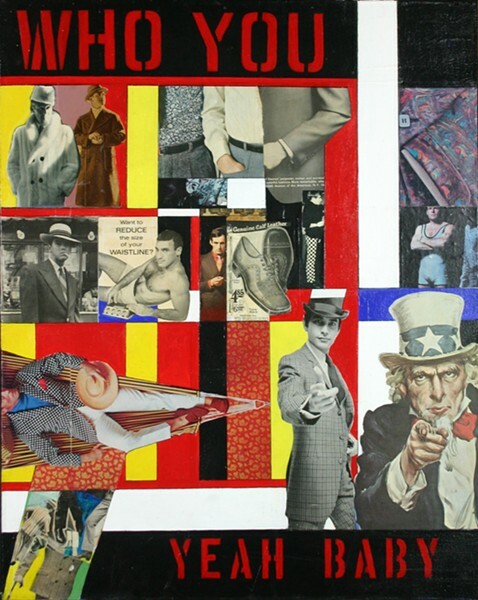 The familiar top-hatted Uncle Sam points a finger at the viewer from the right foreground while, behind him, backed by a handful of suggestive male fashion images, a plaid-suited dandy strikes the same pose, with ostensibly different intent. Arnold met his life partner, silversmith William Frederick, who was white, in 1955. They lived together, mostly in a house they bought in Old Town, until Arnold’s death in 2006. A catalog essay by Timothy Stewart-Winter quotes (from a 2004 Chicago magazine profile by Kevin McKeough) this exchange about how they managed the public view of their relationship: "Arnold says, 'We’ve never been closed about it'—and Frederick responds, 'We’ve never been open about it, either.'" The title of the show comes from a 1975 collage of photo-booth style self-portraits in 25 guises. As the essayists note, as a veteran, an artist, an academic, and a black gay man with a white partner, Arnold moved in multiple mid-20th century circles and was keenly aware of the performative aspect of identity. After the roiling 60s and 70s, he apparently settled into a rewarding role as professor and mentor (he was a longtime member of the Illinois Arts Council and the South Side Community Art Center board), while his own art began to disappear from view. 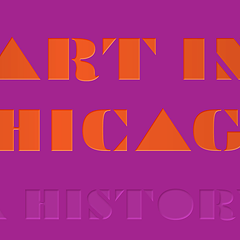 Foster-Rice says this exhibit, supported by the Terra Foundation's Art Design Chicago program, contains many pieces not seen publicly for decades. 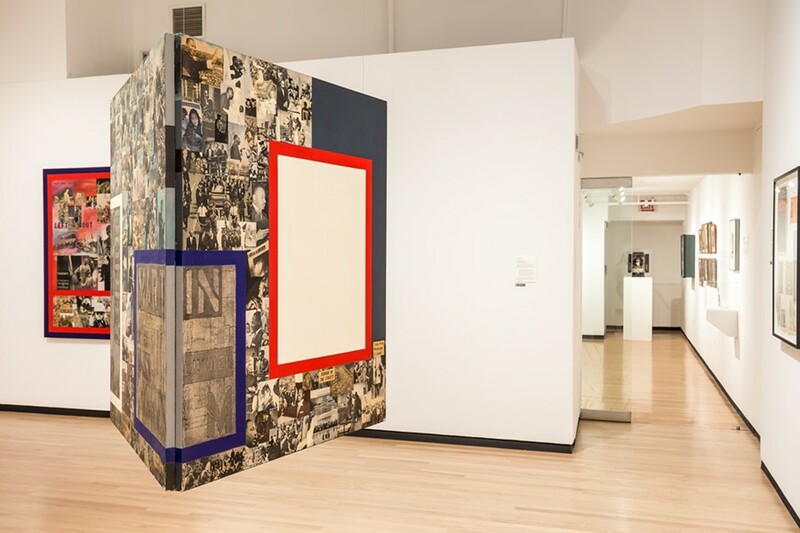 A companion exhibit of 21st century collages, "Echoes: Reframing Collage," is on view in the museum's upstairs galleries.